David Brooks seems to get it right in taking apart Sam Huntington's position about the unique challenge of Hispanic immigrants. While I don't have a lot of patience for people who argue against assimilation and for bilingual everything, I see no reason to think that Hispanic immigrants can't or won't assimilate anymore than the Germans, Italians, Poles, Irish, Jews, Chinese, or Vietnamese weren't able to – no matter what the Reconquista conspiracy theorists think. Frankly, something's a little off in Huntington's use of the term "Anglo-Protestant" to describe American culture. There is no question that we have all been shaped by the legacies of Jonathan Edwards and Benjamin Franklin. But the mentality that binds us is not well described by the words "Anglo" or "Protestant." While my position on gay marriage is too complicated to sum up in a short post, I completely disagree with this move: Congress Is Urged to Pass an Amendment to the Constitution. You don't go messing with that document to take freedoms away from people, even people you have a problem with. Almost simultaneously, Julia sent me the New York Times article, Scientists Say Administration Distorts Facts, and Mike F. asked why I hadn't blogged about this similar USA Today article, which should be "right up my alley". Both articles discuss this Union of Concerned Scientists report on Scientific Integrity in Policymaking, which was billed as "an investigation of the Bush Administration's misuse of science". The report (available here as a PDF), and a statement signed by 20 Nobel laureates, blasted the administration for "censorship and political oversight of government scientists", as well as distortion and misrepresentation of scientific facts for political purposes. Now Mike is right, I take science pretty seriously (too seriously epistemologically according to Julia) and I have no patience for bad science or distorted science in the public sphere, whether trying to pass Daubert tests to go after corporations, or to justify "creation science" alternatives to evolution. Where the Bush Administration ignores or suppresses scientific knowledge to justify their policies (and there are instances of this – more on this below) they deserve to be excoriated. But the short answer to Mike's question about why I hadn't blogged on the topic is that I had read the articles and written them off – basically I didn't buy their premise. Contrary to their headlines and ledes, the UCS report, rather than the unbiased critique of an independent organization of scientists, is just another election year partisan attack, picking up on the compelling meme of an administration that plays fast and loose with the truth. Although their name conjures up comforting images of geniuses, united in their avuncular concern for the fate of humanity, the reality is one of activists (yes, some of whom are scientists) united in their radical environmentalism. Not that that negates their criticisms, but it does, in my mind, make it much less of a story – more like, "Greenpeace says Bush Administration misrepresents facts about environmental damage of drilling in ANWR" – not such a shock. Greenwatch, an admittedly conservative non-profit monitoring group, gives the UCS a 1 on an ideology scale, where 1 is "radical left" and 7 is "market right". NCPA Adjunct Scholar S. Fred Singer, president of the Science & Environmental Policy Project and a former official with the Environmental Protection Agency said, "UCS is an advocacy organization of mainly non-scientists that specializes in signing up prominent scientists for political causes." Finally, and most ironic, the UCS led the charge condemning Bjørn Lomborg's The Skeptical Environmentalist, applauding when the Danish Committee on Scientific Dishonesty found Lomborg "guilty" of not living up to scientific standards. Unfortunately, the Danish Ministry of Science later cleared Lomborg, saying that the attempt to silence him was "completely void of argumentation". So I think I was right to question the objectiveness of their analysis. But none of this should detract from their criticism of the Bush Administration – that should stand on it's own. So what about the report and what it actually says? After coming to office, the administration asked the National Academy of Sciences (NAS) to review the findings of the Intergovernmental Panel on Climate Change (IPCC) and provide further assessment of what climate science could say about this issue. The NAS panel rendered a strong opinion, which, in essence, confirmed that of the IPCC.... Yet Bush administration spokespersons continue to contend that the uncertainties in climate projections and fossil fuel emissions are too great to warrant mandatory action to slow emissions. (Emphasis added.) Notice the change from the statement about scientific results (the NAS panel confirming the IPCC report) to a policy decision. A cost-benefit analysis needs to be used to decide policy, not just an appeal to scientific fact, otherwise we are free to make statements like "the studies show that drivers over 70 years old are 5.3 times as likely to get in an accident as younger drivers.... but the administration continues to contend that mandatory revocation of their licenses is unnecessary." It's a non sequitur without the cost-benefit analysis. Further down, they criticize the administration for asking in June 2003 that the findings from a "discredited study" be added to the EPA report in place of the infamous hockey stick graph. They footnote the Soon & Baliunas's paper in Climate Research and Michael Mann's response in Eos. There is a problem with this critique, though. First, while certainly contentious, there was and still is debate about the original paper as well as the hockey stick it attacked. Soon still stands by the work. (If your not familiar with this paper, four editors of Climate Research ended up resigning over it – despite passing peer review, after drawing fierce criticism from environmental advocates, the journal said that the paper should have been edited before being published because some of the summary statements, while perhaps true, could not be conclusively shown from the data). But more importantly, Mann's response that "discredited" it wasn't published until July 2003, a month after the administration asked for the addition. The UCS report implies otherwise. In addition, they quote EPA "internal memos" that the Wall Street Journal reports were simply e-mails between EPA employees, not official memos. Other issues include concerns about criteria for the selection of scientists for advisory panels and litmus tests for appointees. These are troubling, just as are litmus tests for judicial nominees, but excuse me for thinking that it's not uncommon to appoint people with views you approve of to these advisory panels. Given the slant of some of the other criticisms, I'd hesitate to get too worked up over this issue until I've seen evidence that other administrations acted significantly differently. It's wrong when it happens, but like pork barrel legislation, it's hard to criticize one party for it when the other is waiting to get their fill. The list continues with an assortment of incidents in environmental and public health areas. Reading the report cynically, you can't help but wonder whether the issues are "a random selection of incidents and issues," as White House science advisor John Marburger said. Are these just sour grape issues, where the UCS disagrees on policy, or is the Bush Administration worse than normal? The cynic in me says that this is de rigeur inside the beltway, and has been since before there was a beltway. Would the Clinton administration have embraced (did they?) studies that debunked global warming, showed gun control to be ineffective, proved TV violence caused aggressive behavior, or questioned the harmful effects of marijuana? I suppose, though, that we should measure an administration against the administration we would like to have as well as the administration we are likely to have. So, to that end, there are three specific areas where I think this administration does use junk science and does exert too much influence over scientific findings: drug research, stem cell research, and reproductive health. The first can't be pinned on Bush alone, while the other two are specific to Republican administrations. My feelings about each are different, though. Since 1936's Reefer Madness junk science has been used to fight the war on drugs. Although less openly racist today, the desire to be good drug warriors has led both Democratic and Republican administrations to ignore studies that minimize the dangers of marijuana in relation to alcohol or cigarettes, that tout the health benefits of needle exchange programs, or that highlight the potential health benefits or medicinal uses of currently illegal drugs. While slightly more rabid (with Ashcroft) in its approach than previous administrations, Bush cannot be blamed for the pervasive distortion in this area. As far as stem cell research goes, the Bush Administration openly constrained what scientific investigation is allowed, caving to the religious right to some extent. While I disagree with the policy decision in this case, I do see this as one where policy needs to drive science, rather than science driving policy. If stem cell research truly is immoral, like, say, testing chemical weapons on prisoners, (which I don't believe) then our policy should be to ban it, not wait and see if we learn anything from it. Unfortunately this is a normative issue, not one that science can help us out with, and our morals need to inform our policy. Finally, and this is probably my largest gripe in this area with the current administration and one in which I agree 100% with the UCS report: reproductive health. The promotion of abstinence-only approaches to contraception and STD prevention over condoms. The delaying of an over-the-counter version of the "morning after pill". The obfuscatory language of the "partial-birth abortion" ban. These all distort scientific studies, misuse scientific oversight abilities, or abuse scientific terminology to push a conservative agenda. These are as misguided as not funding third-world population control efforts simply because they also offer education about abortion, and they are inexcusable in my mind. So that's where I stand. Comments? So, I jumped from InstaPundit to Jeff Jarvis' BuzzMachine to read about coverage of the Iranian elections by Iranian blogs, when I saw this post: Surprise. Next thing you know, I'm reading about Mike Weiksner's talk today at the Information Law Institute. And I'm having dinner with Mike tonight. Weird huh? 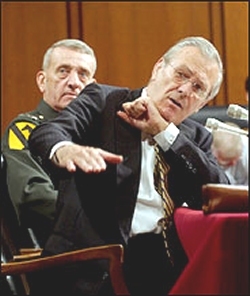 Via InstaPundit, come these shots of Rumsfeld's unorthodox, but still dangerous, martial arts technique. My favorite: Drunken Temple Boxing! And here's a few of him really letting loose. The gun registry was originally supposed to cost less than $2 million. In December 2002, Auditor General Sheila Fraser revealed that the program would run up bills of at least $1 billion by 2005. But the calculations remained incomplete, so CBC News obtained documents through the Access to Information Act and crunched the numbers. Somehow, the computer system to track the registered gun owners will cost more than $750 million instead of the $1 million expected. At first glance, I would have sworn this was a Sandcrawler. 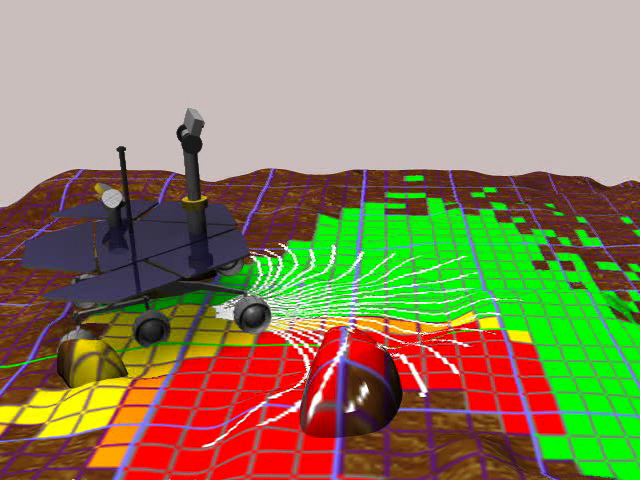 Seriously though, it's pretty amazing to think that we have two rovers on opposite sides of Mars that are autonomously navigating and talking to two communications satellites (Mars Global Surveyor and Mars Odyssey) in orbit above them. 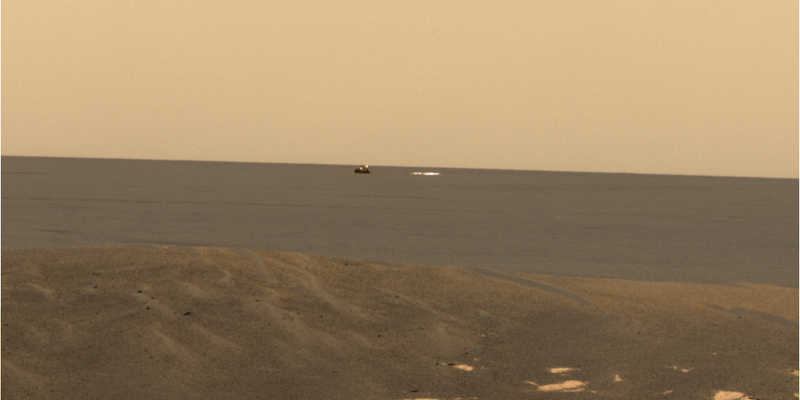 And all this is going on around another planet, over 10 light-minutes away. While I think the idea of a major government initiative to send men to Mars is absurd until we can cheaply and safely get to orbit, this does get me excited about the prospect. Update: Added the image above. So, the father of the Pakistani nuclear program, Abdul Qadeer Khan, has "confessed to sharing weapons secrets with regimes around the world." The list of countries includes Iran, Libya, and North Korea — none of whom are on the good guy list. Evidence from Libya's program (now safely ensconced in Knoxville) and admissions by Iran to the IAEA all pointed to Pakistan, and the US reportedly put a great deal of pressure on Musharraf to find the source of the information. Dr. Khan now says that he shared the information with the full knowledge of Musharraf and the ISI (Pakistani intelligence service). That's obviously bad news (even if it's not true) because Musharraf has been as good an ally in the war on terror as anyone in the region, and he finally looked to be pushing for real peace with India (perhaps spurred on by the recent attempts on his life). Regardless, there is obviously something seriously flawed with the current non-proliferation regime. And it appears that a serious network exists for passing around technology and materials. Hopefully Libya is an example of what hardball tactics combined with credible threats can accomplish — a first tug on a thread that unravels a great deal more. But in the mean time, the fact that Libya was much farther along in their program than we expected should make us feel even less comfortable about the mad man in Pyongyang. If you haven't been following what's going on in Iran, you should be. Short summary: the mullahs banned thousands of candidates for parliament because they were a risk to the nation. People objected, staged sit-ins and appealed to the council of clerics. The council allowed a few people back on the list, but refused to reinstate them all (I think there are still like 6,000 banned). Ayatollah Khamenei, the Supreme Leader, told the council of clerics to reconsider, but they defied him. They also refused a request to postpone the elections until the issue could be settled. This weekend, about a third of Iranian members of parliament resigned in protest and there is concern that the reform parties will urge people to boycott the elections. There is concern that paramilitary groups, including the Basij, will carry out coercive polling if reformists try to interfere with the election. Students asked for permits to protest but their requests were refused. Civil war is obviously a concern, particularly given the fragile situation in Iraq and Afghanistan, and the current status of Iranian nuclear programs. See a round up at OxBlog. Also, this most recent article at Albawaba. So, today, I got hit with my first major comment spammer. Previously, I had had one other person who posted non-sensical comments and a link to a few articles, but this one was full-bore, automated postings to every single article. The text was exactly the same and was an advertisement for something or other. Luckily, MovableType has IP address banning, so I was able to block them in the middle of their posting. But not before 120 comments had been posted. Had to write some SQL to delete them from the database and then rebuild the whole site. Yeesh. I guess this is a coming-of-age ritual for Just-in-casionally. Hopefully it's not the start of an annoying trend.